Philadelphia Flyers captain Claude Giroux celebrates after scoring a goal during the second period against the New York Rangers. The chants of “MVP, MVP, MVP” were enough to shake the rafters of the soldout Wells Fargo Center on Saturday afternoon. And, unlike on Thursday night, when he claimed not to hear them, there was no way for Claude Giroux to avoid them. The Flyers’ captain put on a virtuoso performance against the visiting, hapless New York Rangers, scoring his first regular-season career hat trick, reaching his first career 100th-point season and, in doing so, delivering a playoff-clinching 5-0 win to a city that's been doing quite a bit of that lately. After missing the playoffs a year ago, the Flyers (42-26-14) concluded what was a rollercoaster 2017-18 season with 98 points, their highest total since their 103-point season in 2011-12. That's also the last time the Flyers won a playoff series. Currently, they sit in third place in the NHL’s Metropolitan Division, ahead of the New Jersey Devils and Columbus Blue Jackets, meaning the Flyers’ first-round playoff opponent could be their old nemesis, the two-time defending Stanley Cup champion Pittsburgh Penguins. Other options include Washington, Tampa Bay and Boston. And in the win, “G” put the finishing touches on a career season that should have him in contention for the Hart Trophy. Giroux posted 34 goals and 68 assists for 102 points, becoming the sixth Flyer to reach the century mark, and first Flyer to accomplish it since Hall of Famer Eric Lindros, when he hit 115 points in the 1995-96 season. He was unstoppable against the Rangers, scoring two goals in the second and another in the third. And just for good measure, he, along with Michael Raffl, took down a franchise record against the Rangers. The two combined for the fastest pair of goals in team history when they scored six seconds apart in the second – Raffl scored with 2:07 left in the period and Giroux followed at 2:01. “He was dialed in,” Flyers’ coach Dave Hakstol said, in reference to Giroux. “You could tell and see that all the way through. I think we’ve seen that over the entire stretch run here, and you know not just G. G is our captain and a leader for us, and he certainly showed that tonight, he went out, did the job. During the Flyers’ push to the playoffs, Giroux has been nothing short of sensational. Over their final 19 games, Giroux scored 12 goals and added 16 assists – and recorded at least a point in 18 of those 19 games. He ended the regular season on a 10-game point streak, which included eight goals and 11 assists for 19 points. With his three points against the Rangers, Giroux moved into second in the NHL in scoring, two points ahead of Tampa Bay’s Nikita Kucherov, whose season concludes tonight. He also became the sixth Flyer in franchise history to post a 100-point season. Once again, the fans showed their appreciation for the city's longest-tenured pro athlete. And this time, he heard them. Even the usually stoic and emotionally reserved veteran who doesn’t like to get too keyed up for games couldn't help but smile from the bench as the cheers rained down. 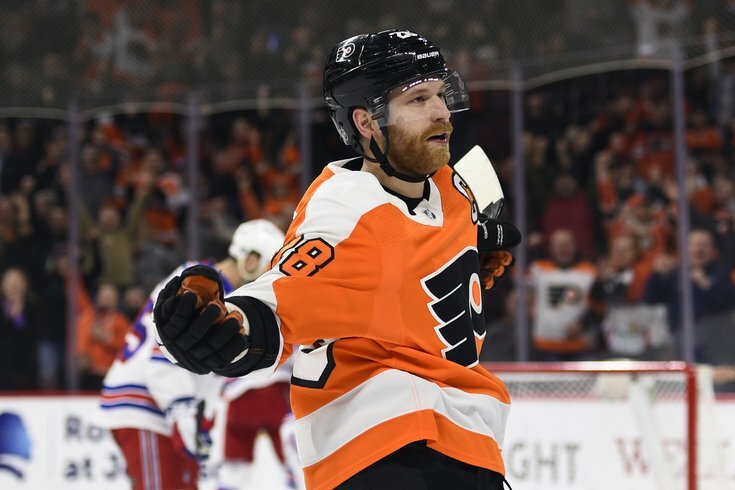 “I think you kind of learn a little bit while you go through seasons to make sure you focus on the right things and you don’t try to do too much,” Giroux said. “When you try to do too much that’s when you get caught doing the wrong things, but I think everyone was pretty dialed in for the game.